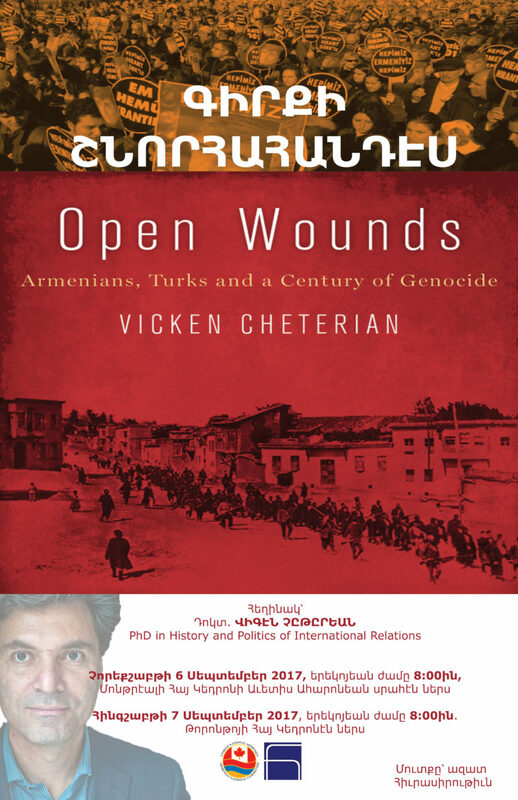 On September 6th and 7th, join the Armenian National Committee of Canada and the Hamazkayin Armenian Cultural and Educational Society for the launch of Dr. Viken Cheterian’s newest publication, “Open Wounds: Armenians, Turks and a Century of Genocide” in Montreal and Toronto respectively. The event will include introductions by the organizing committee, a presentation by the author, Q/A sessions and a book signing opportunity. The assassination in Istanbul in 2007 of the author Hrant Dink, a high-profile advocate of Turkish-Armenian reconciliation, reignited the debate in Turkey on the annihilation of the Ottoman Armenians. Many Turks subsequently re-awakened to their Armenian heritage, reflecting on how their grandparents were forcibly Islamised and Turkified, and the suffering they endured to keep their stories secret. There was public debate around Armenian property confiscated by the Turkish state and the extermination of the minorities. At last the silence had been broken. Turkish intellectuals acknowledge the price society must pay collectively to forget such traumatic events, and that Turkey cannot solve its recurrent conflicts with its minorities – like the Kurds today- nor have an open and democratic society without addressing the original sin on which the state was founded: the Armenian Genocide. Vicken Cheterian is a lecturer in history and international relations at the University of Geneva, and Webster University Geneva. He was born in Beirut where, after finishing Hovagimian-Manougian secondary school he studied at the American University of Beirut, graduating with a BA in English literature. He later did his MA and PhD in history and politics of international relations at the Graduate Institute of International Relations, in Geneva. He started working as a journalist in Beirut, before moving to Zurich and Geneva where he worked as a free-lance journalist. In early 1992 he made a trip to Poland, Russia, Armenia and Karabakh, after which he worked for many years in the Caucasus, Central Asia, Russia and Ukraine, publishing in European newspapers, such as Neue Zurcher Zeitung, Die Wochen Zeitung, Le Monde diplomatique, among others. He is a columnist to Agos Weekly, and regular contributor to al-Hayat. He is also the author of several conflict-resolution projects, and media training initiatives in conflict zones of the Caucasus and Central Asia, financed by the Swiss Federal Department of Foreign Affairs, and Swiss Agency for Development and Cooperation. He was the founder of the Caucasus Media Institute, a media training and research centre based in Yerevan, which he directed for three years (2001-2004). He has also consulted various UN agencies, the Organization of Security and Cooperation in Europe, the World Bank, etc. He has over a dozen academic articles, and is the author of War and Peace in the Caucasus, Russia’s Troubled Frontier, published by Hurst in London and Columbia University Press in New York, 2008, and the edited volume From Perestroika to Rainbow Revolutions, Reform and Revolution After Socialism, 2013, and his most recent book is Open Wounds, Armenians, Turks and a Century of Genocide, was published by Hurst (London) and Oxford University Press (New York) in 2015.